2INPOWER is Rotor's latest most advanced power meter, offering true left-right power analysis in a performance crankset upgrade that's fully compatible with both round and Q-Rings. 2INPOWER is rotor's latest – and most advanced – power meter, offering true left-right power analysis in a performance crankset upgrade that's fully compatible with both round and q-rings. Power data is collected independently for each leg to give the most advanced power metrics available on the market. The left leg is measured through INPOWER's usual axle-based strain gauges, the electronics of which are linked to new sets of strain gauges placed on the driveside crankarm that measures the right leg. This opens up the opportunity for riders to get the most detailed pedalling analysis possible, including balance, pedal smoothness and torque effectiveness. Riders can go even deeper with rotor's 2INPOWER user software which analyses your optimum q-rings orientation and gives a visual representation of your pedal stroke's efficiency to hone technique. This level of depth is available thanks to INPOWER's ability to collect 500 data points per pedal cycle via a built-in accelerometer. This gives exceptional accuracy and ensures full compatibility with q-rings. Riding data from 2INPOWER can be transmitted via ant+ or bluetooth smart, making the unit future proof for the latest head units on the market. 2INPOWER also features a USB-rechargeable battery that offers 250 hours of riding time per charge. The battery will take 300 full charges before deteriorating, which equates to around 41 years of use if you ride five hours every day. Hidden behind a simple cover that swivels out the way, the charging port uses a magnetic connection to keep the internals sealed away from water ingress or other contaminants. LED lighting around the circular port indicates charging status. The crankset itself is available in various lengths and is made from cnc machined aerospace grade 7015 aluminium. 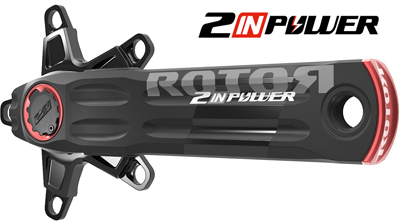 2INPOWER represents Rotor's stiffest crank system to date while only adding 160g compared to 3D+ INPOWER. The axle is connected to the driveside crankarm while the non-driveside crankarm is held in place with a simple dtt bolt.